Another Variation and A Contest! 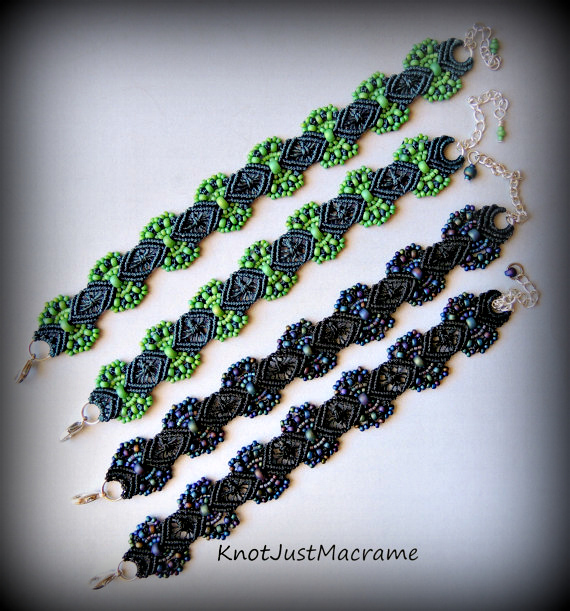 You know how much I love to play around with variations on a theme, whether it's changing a cord color, changing out beads, or modifying a pattern. 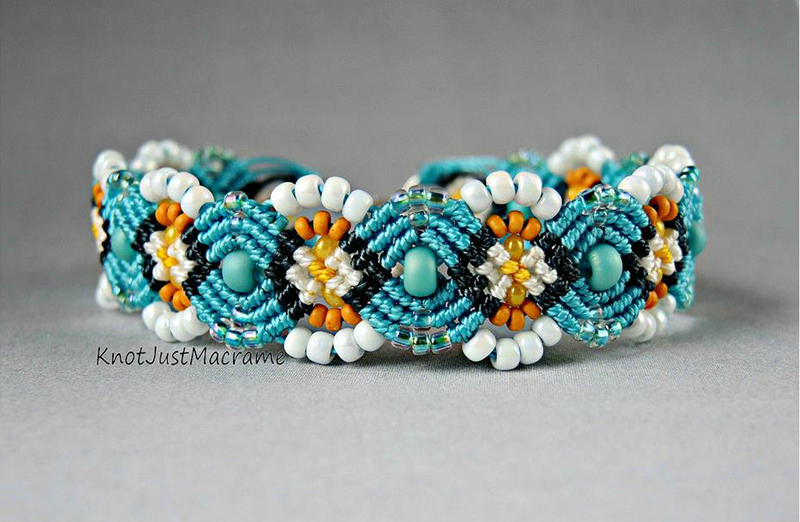 I just finished up this pretty bracelet in soft seaside colors and it's just a slight variation of my Leaves Micro Macrame Bracelet pattern. I started out trying every possible color in a solid colorway in this pattern and then I needed more. I always feel like I need to take it just a little bit further and I'm fascinated with multiple cord colors. I never know exactly where the colors will end up until I've tested it out, so it's like opening a little gift every time. 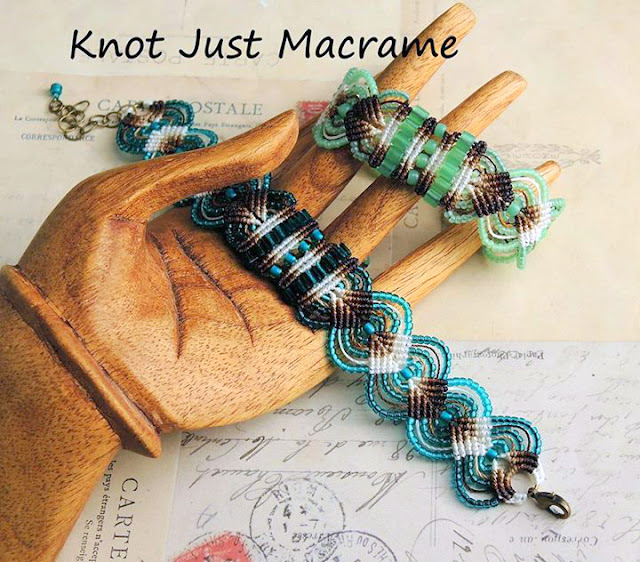 For this new bracelet, I twisted together two different colors of cord and hid that in the center row of beads to get a different color on each end of the piece. Clever, huh? I also switched up the rows of beads in the center of the bracelet. Isn't that lovely? She had such fun with it, she is sponsoring a little competition. The challenge is to take the Hydrangeas pattern and add your own twist. You could add beads where there aren't any or add knots instead of beads. Maybe you could add a tie closure a sliding one. Whatever variation you can dream up. When you've finished it up, head over to this page to enter your creation. You have until July 20, 2015, when she will be announcing the winner. And the best part? 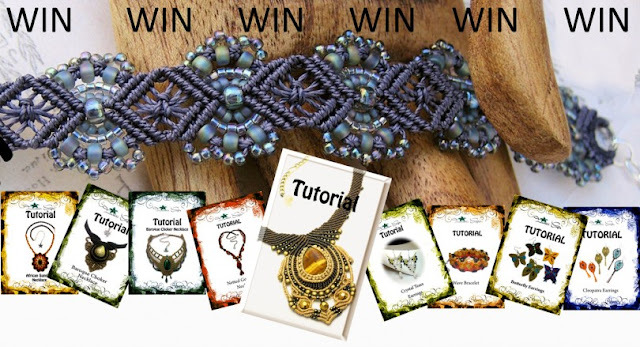 You can win any four of Nadja's micro macrame tutorials - you get to choose! I'm a compulsive buyer, I'll admit it. I see something beautiful and it's not enough to admire it; I want to possess it. I want to be able to touch it and feel the texture and admire the colors close up. 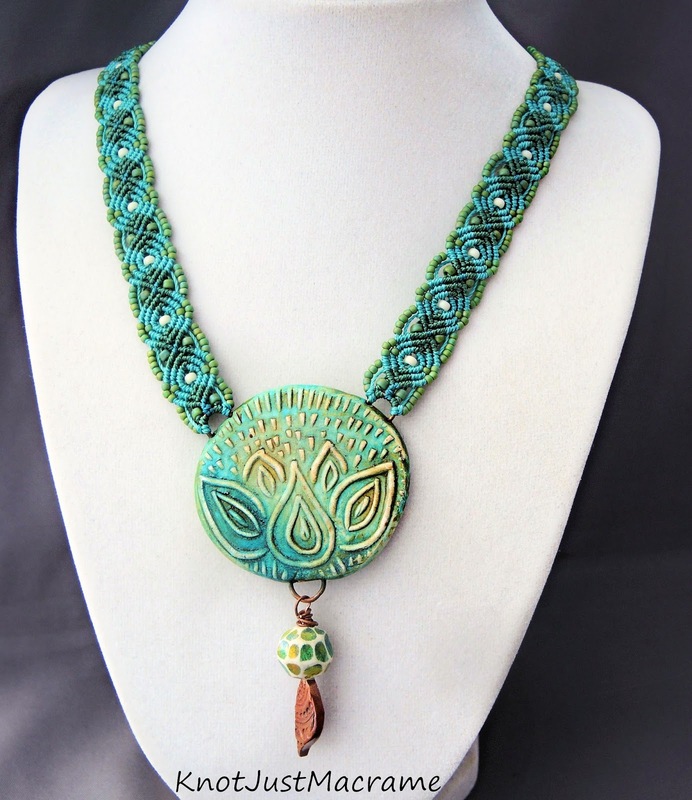 This polymer clay lotus pendant from Staci Louise Originals was one of those pieces I had to own. I was powerless to resist. I'm always a sucker for a lotus motif and the shading she did on this one... ooooohhhhh, the color! The colors of these beads are really soft with a little color variation to them, which plays well with Staci's pendant. To finish off the pendant, I added a faceted polymer clay bead from Barbara Bechtel and a copper leaf headpin from Kristi Bowman Design. I think the combination is something pretty special (then again, I may be slightly biased). It's not that I've forgotten you, I promise. It's been quiet around here because I've been busy clearing up a few projects and orders. 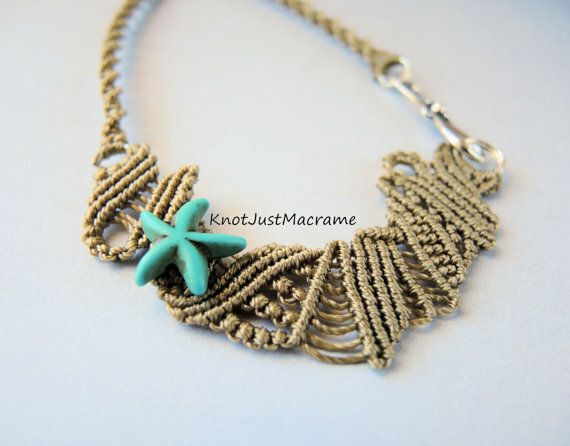 I finished the little free form macrame doodle above for a customer who likes to hang her glasses on her necklace (isn't that a clever idea?). 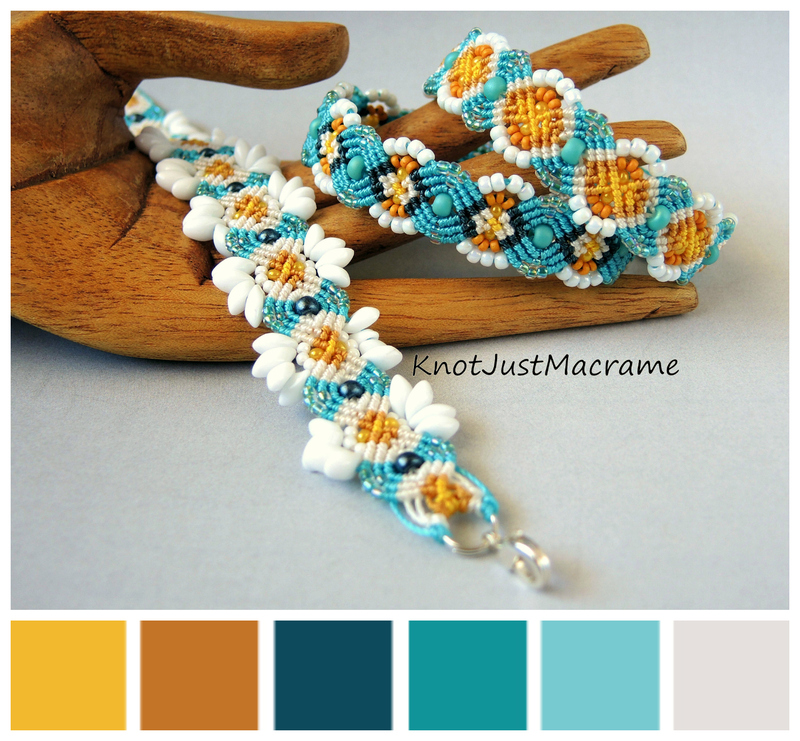 I also finished up an order for a customer who is going to surprise each of her sisters with a micro macrame bracelet at their upcoming family reunion and made one more bracelet in the daisy color palette (you can find the color palette and other pieces in this post). 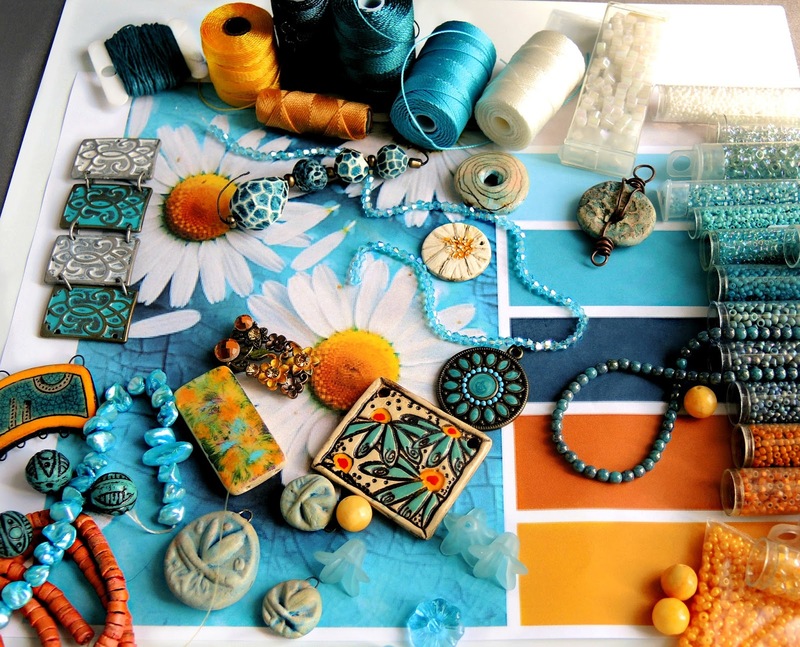 Dry Gulch Beads sponsors a monthly color challenge to inspire creativity. As long as it is newly made specifically for the challenge, anything goes: jewelry, clothing, paintings - even cupcakes! This month's color palette (from Design Seeds) speaks to me. I'm not sure if it is the daisies (love them) or the color palette (notice the teal and turquoise), but I adore it. 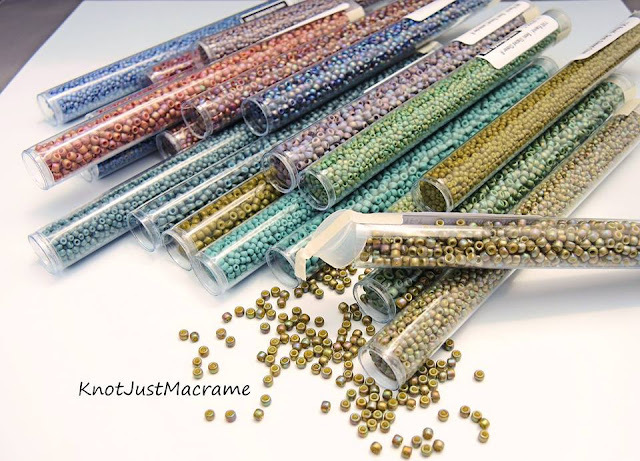 These are the beads and focal pieces from my stash that I thought might work. (Can you name any of the artists?) I just finished up a new micro macrame (microme!!) 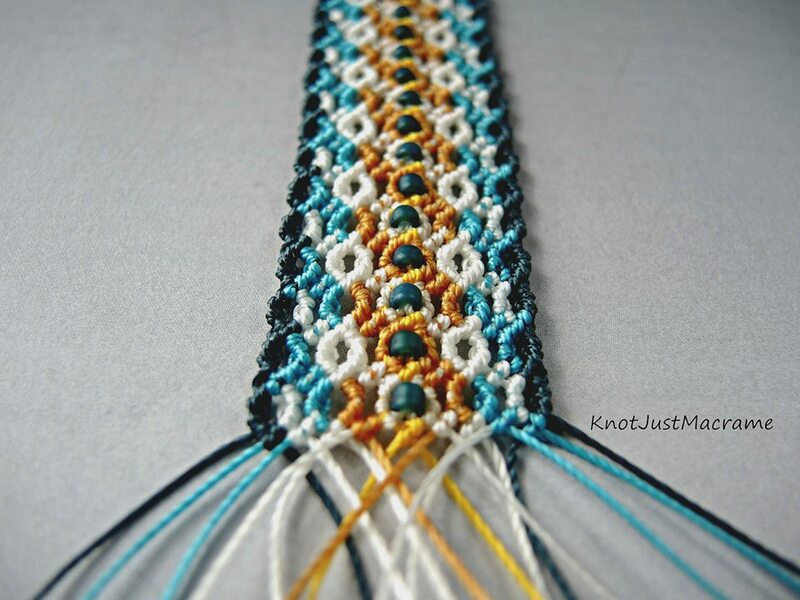 bracelet tutorial last week (Peacock) and I haven't had time to try out every color combination under the sun yet. Heck, I haven't even tried all of the color combinations rattling around in my head for it yet. So this color challenge seemed like as good a place as any to start. The first bracelet I made used all of colors from the palette - four colors of cord and coordinating glass seed beads. I really wasn't sure what look I would get with the different colors and the contrast between them, so I just sort of put the colors in an order I liked and took off from there. 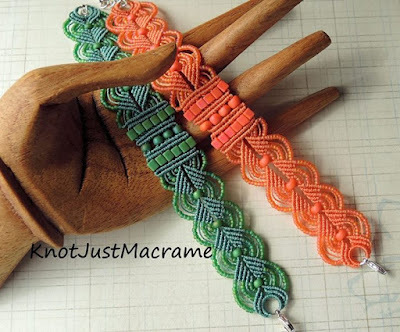 Color placement in macrame is a little different than stringing or bead weaving, etc. 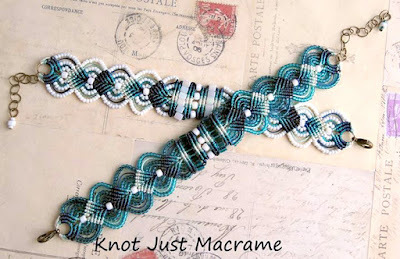 The cord colors meander through the design in a pattern determined by the knots. I have had enough practice now that I can make the colors do what I want a little bit, but it's still not an exact science. The cords will go where the cords want to go (that's my story, anyway). When creating a piece like this, it's always an adventure for me (yes, I'm really that weird). Once I had the knotting underway, I noticed an actual daisy shape emerging. I hadn't really intended to do a literal daisy pattern; I'd just planned on using the color palette. But heck, since I was this close, might as well push it. I went back to the drawing board and took another run at it. Huh. Interesting! 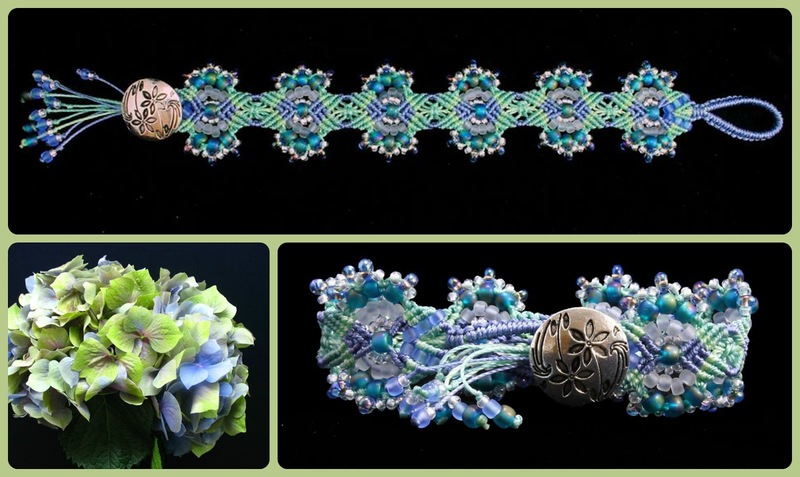 So there you have it: my three daisy palette bracelets. I think I'm still partial to the first one - something about the color placement in that one appeals to me. The third one probably most closely captures the photo and the color palette. It's hard to choose. They're all my babies :) And they're all perfect for summer! Dry Gulch Beads has a page set up for all of the challenge pieces here. I'm off to see how this palette inspired others!